This interesting name is of early medieval English and French origin, and is an occupational surname for the bearer of a cross or a bishop's crook in ecclesiastical processions, or of the cross at a monastery. The name might also have been used of someone who made and sold crosses or to someone living by a cross. The surname derives from the Middle English and Old French word "Croisier" or "Crocier", originally an agent derivative of the Old French "Crois", cross, but later associated also with "Croce" meaning "crook". Job descriptive surnames originally denoted the actual occupation of the namebearer, and later became hereditary. 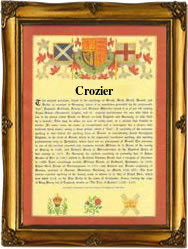 The early recordings of the surname are usually found as "Croyser", while the modern forms are "Crozier, Crosier and Crosser". Joseph Crozier was christened on the 30th March 1713 at St. Botolph, Bishopsgate in London. The Coat of Arms most associated with the name has the blazon of a blue shield, on a silver fess between three gold crosses crosslet placed saltireways, as many black martlets. The Crest being an arm vested erect holding a gold crosier. The first recorded spelling of the family name is shown to be that of William le Croyser, which was dated 1264, in the "Eynsham Cartulary", during the reign of King Henry 111, known as "The Frenchman", 1216 - 1272. Surnames became necessary when governments introduced personal taxation. In England this was known as Poll Tax. Throughout the centuries, surnames in every country have continued to "develop" often leading to astonishing variants of the original spelling.